According to the Equality and Human Rights Commission, 3 in 4 mothers have a negative experience at work. This situation shows that most businesses see pregnancy as a problem. Recent Fawcett Society statistics that 46% of women becoming mothers are seen as less committed but 29% of men becoming fathers are seen as more committed, patchy progress of women on Boards and mixed messages around Shared Parental Leave all highlight the imbalance and need to create a workplace culture that allows men and women to thrive equally. Bumps and the Boardroom, a business focused on exploring the correlation between what takes place around the pregnancy journey and transition to motherhood for high potential women and the affect that this has on their ability to reach the most senior levels of business across a wide range of industries, have announced their plan to reduce maternity discrimination and revolutionise how mothers and business grow together. The public vote is open until 23 May. A shortlist of 160 businesses with the most votes from start-up and grow catergories will go through to a pitchathon before six finalists put their ideas to Richard Branson, Peter Kelly and a stellar panel of judges on 28 June. There are two ways to support:- by placing a vote and /or placing a pledge. Bumps and the Boardroom are inviting men and women in business to be part of a powerful and positive community that will help bring about a groundbreaking shift in current attitudes and behaviour and reframe the way maternity leave is perceived. They are raising funds to start the development of an online hub and training academy which provides clear information, support and guidance to men, women and business to manage maternity differently and value its potential. Virgin Media Business and Sir Richard Branson launched their search for the best businesses on 22 March. Now in its fifth year, VOOM 2016 offers entrants a platform to highlight their success, boost their businesses and shout about the contribution they make to the economy. This year, the entry and online voting platform is powered by Crowdfunder. Entrants have the opportunity to raise funds for their business by crowdfunding their entry. Bumps and the Boardroom is entering in the ‘Start-up’ category and entering the Impact Award for businesses that put social and environmental impact as well as profit at the heart of their business. The award is looking for people with solutions to the world’s most pressing problems. A dedicated PR campaign will highlight inspirational but relatable stories and best practice currently in place to engage men and women, employers and employees, across all industries and challenge current stereotypes. 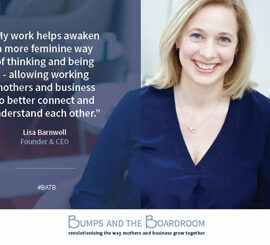 Lisa Barnwell has 14 years experience supporting over 2000 women through their pregnancies and beyond. She has created a unique 12-month program to support high potential women and the corporations they are part of to ensure talent is nurtured and mothers are valued by business. *It is estimated that up to 100,000 women per year are discriminated against during the maternity journey. The 2016 Equalities Commission Report.